Marvel Two-in-One #74: A Christmas Peril! After a day of hard Christmas shopping, Ben and girlfriend Alicia Masters are sending out Christmas cards and Alicia pushes Ben to send one to Alicia's stepfather, the Puppet Master. The Puppet Master is being paroled just as the card gets there, and when he discovers that his supply of radioactive clay (necessary to make his puppets) has disintegrated, he decides to take advantage of Ben to get more of the special clay from the Balkan Mountains that it comes from. He crashes Ben's Christmas party (Alicia invites him up, of course), and eventually he manages to manipulate Franklin Richards into getting the Fantastic Four to agree to give him a ride to the Balkans as a Christmas gift. Ben and Alicia accompany him, and the three are shortly in the Balkans and settled in for the night. The Puppet Master slips out, of course, to go find his clay, but is soon captured by... two wooden soldiers "the size of trees". The Thing and Alicia go looking for him the next day, of course, but are unable to find him. They end up visiting a mysterious old woman named Bova, who is an evolved cow, and her ward, Modred. An approaching storm forces Ben and Alicia to spend the night with Bova. Sort of... on Page 1, panel 1, as Alicia and Ben return from shopping. Alicia comments "I nearly died of embarassment when you yelled 'It's Clobberin' Time' in the toy department," and Ben answers "But Alicia, baby- I just had to have that red fire engine!" Writers and editors paying attention: Modred the Mystic appears in this issue. He also appeared in issue 33, at the end of which he erased Ben and Alicia's memory of himself. Modred also lost his memories over in Avengers 185-187. Not only do they not recognize each other here, no mention is made even in footnotes of the previous appearances. Nice! 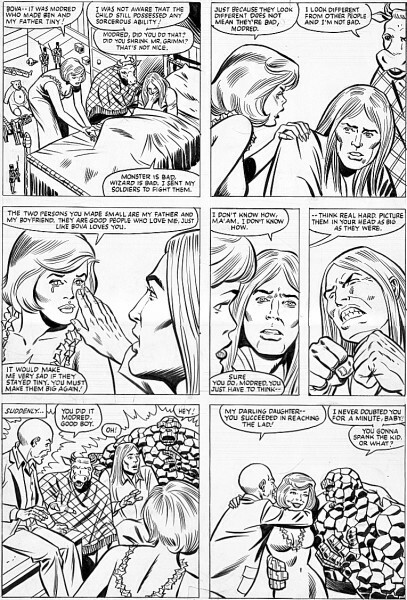 Modred eventually does regain his memories by the time of his appearances in Captain America 304-305. The Christmas party is a very nice scene, simply because it displays that classic Gruenwald knowledge of, and tip of the hat to, character history. Characters range from recent MTIO cast (Dr. Henry Croft from issues 64-72, The Aquarian and his old caretakers, Stingray and wife, Quasar and father) to old-time FF friends (Willie Lumpkin, some of Sue's old childhood friends). The end of this story is very sweet. There have been several issues in this series where the "guest star" was also the "villain", but even though the Puppet Master is a classic Fantastic Four villain (having first appeared in Fantastic Four v. 1, issue 8 and even opposed Ben in this series in Marvel Two-in-One issue 9), he really is the "guest star" here- he and Ben never fight, never oppose each other. Never fear, though, when he next appears in Fantastic Four 236, he's up to his old tricks again. Here's a link to someone's elses's review of MTIO 74. This issue also has the yearly sales figures in it. Total Distribution (E) is listed as averaging 177,201 issues over the previous year. Original art from your editor's collection. Okay, I needed to have a Bova page. Don't ask me why, I just always loved the whole humanoid cow thing. And this is one of the better Puppet MAster stories ever.